This weeks Azure updates & news. This time around the big news is more competition in the IT market for end customers with more CSP. On June 17, Microsoft appointed 5 new indirect 2-tier partners to the Australian based Cloud Solution Provider (CSP) licensing program. These indirect partners are also sometimes referred to as ‘distributors‘. Indirect means selling through the 3 levels of the channel, the distributer at the top-level does not sell direct to the end customer. The channel order is distributer > reseller > end customer. 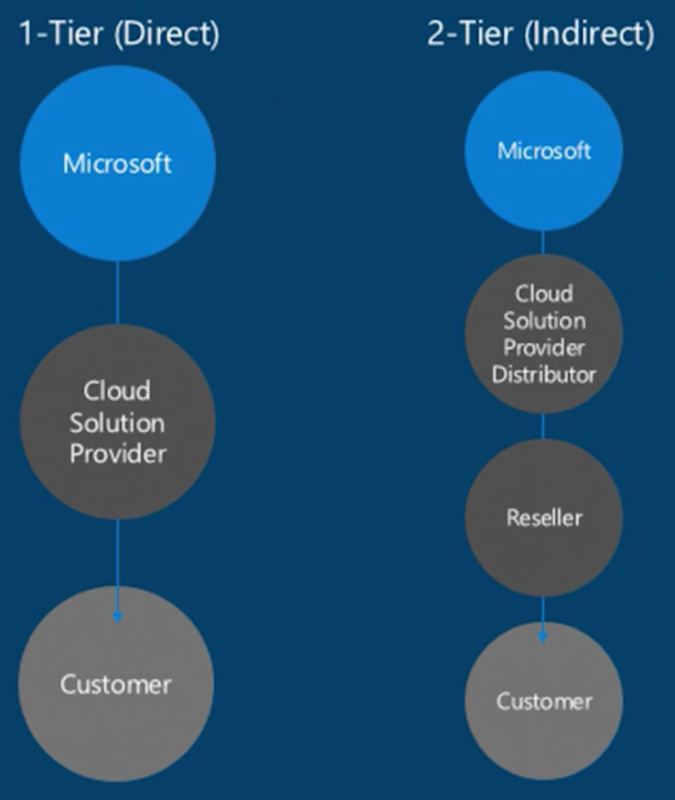 Direct (1-tier) – Resellers would have a relationship with Microsoft as well as the end customer. They would have the ability to invest in their own infrastructure, develop the integration with their accounting systems and provide support & helpdesk services to end customers. Indirect (2-tier) – Distributors or hosters who provide the relationship to the end reseller on behalf of Microsoft. Some resellers might want to build their cloud solution business but don’t want to invest in the infrastructure that it would take to build out the appropriate support or partner billing models. In theory, Azure-Focused companies could provide any products available on CSP, but these companies have each agreed a business plan with Microsoft focused on growing Azure. Originally there were only two CSP licensing providers Ingram Micro and rhipe appointed April 2015. The new additions add much more competition to the market than before. But just being a CSP licensing provider is not that easy, these partners need to innovate by integrating their own systems with CSP APIs. This would enable the partner to sell Microsoft commercial cloud CSP services directly from their own portal in which their customer is already familiar with. Code against CSP APIs, this would be the most popular option to get ahead of the competition. Use the Partner Center website that Microsoft provides, but your customers can’t access that so you have to place the orders for them. If you are a reseller working with a 2-tier CSP distributor then you would normally use the portal that the distributor provides. The 2-tier CSP distributor would need to worry about CSP APIs. June 28 this year sees Office 365 have it’s 5th birthday. Office 365 took over and replaced BPOS 5 years ago. Office 365 now has more than 70 million users for Office 365 Business and 22 million users for Office 365 Consumer. Office 365 has beaten it’s SLA for the past 3 years consecutively. OneDrive for Business seems to be the most popular of Office 365 services followed by Exchange Online. June 16 saw the announcement of Azure Backup support for Azure premium VMs (virtual machines). All functions of Azure backup are available including both backup and restore procedures. However the restore process allows the choice of choosing to restore the VM to either a standard or a premium storage account. Premium VMs use premium SSD storage. As premium storage is still expensive and not yet mainstream, when backup occurs, premium VMs are backed up to the customer’s premium storage account used as a ‘staging’ area before it is then copied to the backup vault. Microsoft say this is to minimise the impact of IOPS on the production workloads. The staging area is only temporary and once backup data is copied through to the standard storage based backup vault in the backend, the premium storage based staging area is cleaned up. Announced June 16 is updated documentation to guide customers around the hot topics of BC (Business Continuity) and DR (Disaster Recovery). Microsoft calling this the ‘resiliency technical guidance‘ documentation previously called ‘business continuity technical‘. This documentation takes you through an array of disaster scenarios and shows you all your options, how to deal with each scenario proactively and likewise what Azure has available to help protect you from these disasters. When things do go bad, it shows what Azure does getting you back up and running Vs what you are expected to do when things go pear shaped. Think about Geo-Redundant storage accounts for example which is PaaS where you have no control over the design of the platform or underlining infrastructure. If the primary datacenter which houses your data goes down, what do you do? This documentation basically says you do nothing, it’s Azure that will make your data available again to you by re-routing the DNS name of your storage account to the secondary datacentre. On June 22 Microsoft announced the new Azure Information Protection, it is basically an upgrade of the existing Azure Rights Management (Azure RMS) by adding in the functionality of Secure Islands which Microsoft acquired late last year. With Windows 10, Azure Active Directory (Azure AD) users now have the ability to securely synchronise user and application settings data to the cloud similar to how Roaming User Profiles works. Like how Apple iOS devices work, Enterprise State Roaming means that people can logon to different Windows 10 devices while taking advantage of the same user experience across the board. Separation of corporate and consumer data – no mixing of corporate data in a consumer cloud account or consumer data in an enterprise cloud account. Enhanced security – Data is automatically encrypted before leaving the Windows 10 device by using Azure Rights Management (Azure RMS) and data stays encrypted at rest in the cloud. Better management and monitoring – Provides control and visibility over who syncs settings in your organisation and on which devices. A point to note, you need to have Premium Azure Active Directory (Azure AD). Theme: desktop theme, taskbar settings, etc. Internet Explorer settings: recently opened tabs, favorites, etc. Passwords: Internet passwords, Wi-Fi profiles, etc. Language preferences: keyboard layouts, system language, date and time, etc. Ease of access: high contrast theme, Narrator, Magnifier, etc. Other Windows settings: command prompt settings, application list, etc. Announced June 20, Azure Media Services resources can now be created and managed using APIs provided by the AMS Resource Provider, all through the Azure Resource Manager REST API endpoints. Also announced on June 6 was the welcome addition of Azure Media Services to the new Azure portal, nick named the ‘Ibiza‘ portal. This is a welcome change for all companies that are licenced through CSP, as CSP is only Azue Resource Manager, they can now make use of AMS. The only major Azure service that is still only on Classic ASM only is Azure RemoteApp. Microsoft say Azure RemoteApp will appear on Azure Resource Manager in the July-Sept timeframe this year.